Winter in California can be anything you want it to be. From snow studded mountains to warm deserts. You can be outdoors 24/7/365! But even here in California is can be difficult to make the time for outdoor activities in the middle of winter. It’s hard to drag ourselves out for fresh air and exercise. So it’s important – for our health and sanity – to find some fun excuses to get outside. There are so many benefits to doing so: being active outdoors is a good way to cut calories and lose weight, the fresh air makes us feel better, and it’s a lot more fun than watching TV or surfing the Internet all day. So we’ve tried to make it a bit easier by giving you two weeks’ worth of ideas. If you do live in one of California’s colder climes, you need to be prepared. Don’t just head out in sneakers, jeans and a sweater under your coat. Think layers. Wear thermal leggings and several layers under your sweater. Wear a hat and gloves. If you’re not cold and uncomfortable, you’re more likely to have fun and not run back inside after 5 minutes. 14 Winter Fun Ideas… To Get You Motivated. Go Camping (of course we’d say that….but with California’s year-round weather you can always find a sunny spot.) When you get there…wrap up in a blanket, sip a cup of hot cocoa and enjoy the sunshine. Build a winter bonfire and make s’mores. Even if you don’t go camping….you can do this anywhere! 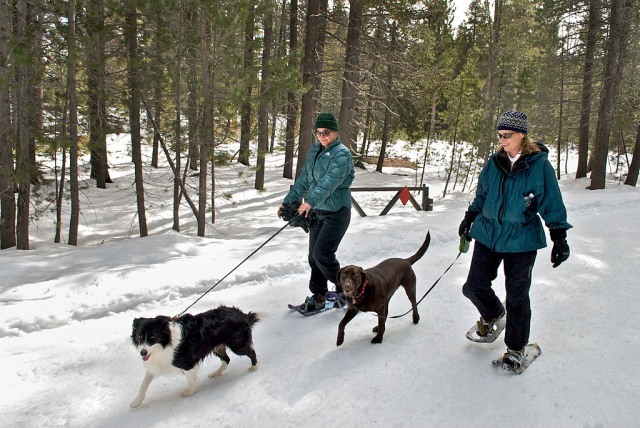 Rent some snowshoes and go snowshoeing. Check out California’s Sno-Park pages. Go ice skating. Check out rinktime.com to find one close to you. Attend a dog-sled race. You don’t have to live in Alaska to see one of these – a quick Google search showed races and tours all around California. Feed the birds or go birdwatching. Make your own birdfeeders out of pine cones, peanut butter, and birdseed. California is one of the largest flyways in the country. Go to CAWatchableWildlife.org to find winter birding sites. Go on a winter picnic. Take blankets, sandwiches and hot soup in a thermos. Try a round of golf. In sunny southern California, no problem. Even in the mountains… you can golf with fluorescent balls! If you live near a big city, set off on foot to explore it! You might want to check out some of the group buying daily deals sites like Groupon and LivingSocial to find new things to do in the area. Have kids or dogs? Set up an obstacle course in the yard with jumps, tunnels and other challenges. They’ll love you!